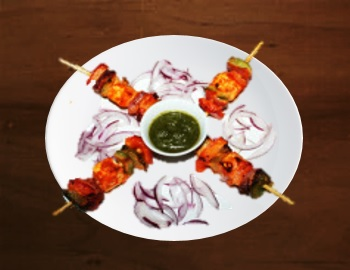 ﻿P﻿aneer Tikka kebab is a wonderful dish. You do not have to eat meat to enjoy kebabs. There is a better, tasty mouthwatering, spicy paneer kebab, even the meat eaters would like to first taste these paneer tikkas over chicken or meat kebabs. Paneer tikkas are delicious high in protein easy to make and very tempting starter. As Paneer tikkas or kebabs are made for snacks but you can make several dishes like kati rolls, paneer tikka masala or butter paneer with them. 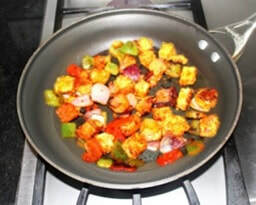 In this dish paneer cubes marinated in masala and then grilled with vegetables. 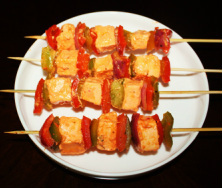 Paneer tikka is a great dish for the summer barbeque parties and dinner parties and usually served as a snack. Sprinkle some chaat masala over paneer tikka's and serve with green chutney or mint chutney. 1. 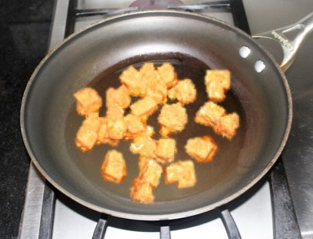 Cut the paneer into 1” wide and ½” thick cubes or the preferred size. 2. 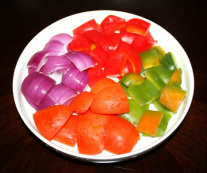 Remove the seeds from the capsicums and chop them into 1” pieces. Peel and cut the onion into 1” chunks and separate the layers. 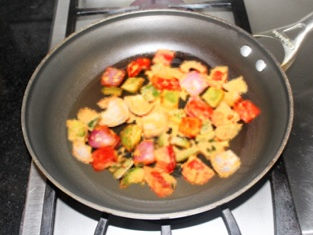 Remove the pulp and seeds from the tomato and chop into cubes. 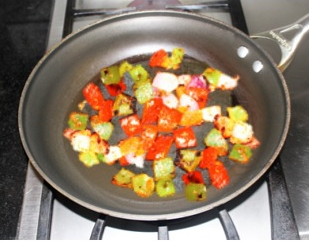 Chop the vegetables into same size as paneer cubes so that they get uniformly browned. few seconds. Then add Besan and roast until you get nice nutty flavor. 4. In a bowl, add yogurt, grated ginger, minced garlic, tandoori masala , salt, red chili powder, turmeric powder, garam masala, ajwaiin, chaat masala kasuri methi , red food color, lemon juice, melted butter or ghee and besan and mix them together and make a smooth mixture. 5. Divide this marinate into two bowls. One for paneer cubes and one for vegetables. 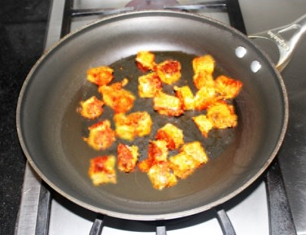 Marinate paneer and vegetable separate to avoid paneer from crumbling when mixing with the marinate mixture. 6. Mix the vegetables and paneer well so that they have a good coating of marinade. Cover the bowl and place them in refrigerator to marinate for 2 to 3 hours. More the better. 7. 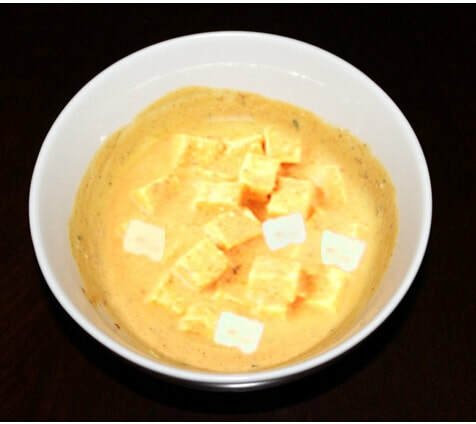 Before grilling take the paneer out of the refrigerator and leave it on kitchen counter at room temperature because paneer becomes hard in refrigerator and it breaks when you are threading them on the skewers. 1. 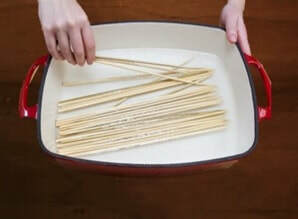 If using wooden skewers then soak the skewer sticks in water for 30 minutes to protect it from burning or turning black. 2. 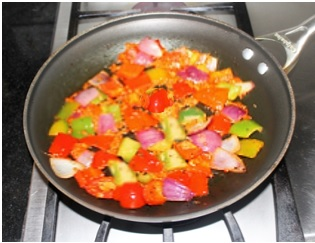 Capsicum and onion takes longer to cook then paneer, so we sauté them before grilling. Heat 1 tablespoon of oil in a frying pan and add marinated bell peppers and onion and tomatoes and sauté them on medium high heat for 5 minutes or until they become little tender but crisp turn the stove off. Paneer and vegetables do not drop through the tines. that will help kebabs remain stable. ​ oven and bake it. 7. Let the paneer tikkas cook for 7 to 8 minutes then turn them around and let them cook for another 7 to 8 minutes or until they turn brown. You will know your paneer tikka’s are done when the sides of paneer have turned slightly brown.Timing of cooking paneer tikkas varies because oven temperatures vary from oven to oven. 8 Sprinkle some chaat masala and lemon juice and serve paneer tikkas with green chutney (Dhania chutney) or mint chutney. Serve the tikkas immediately otherwise as paneer tikkas cool down they become hard. 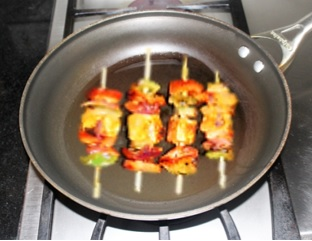 You could also grill paneer tikkas on outdoor grill (barbeque grill) or over the stove top grill. Grilling over grill gives smoky flavor. the basting brush lightly oil the grates. 3. With a basting brush baste the threaded paneer tikkas with oil or melted butter. If you do not have tandoor, oven or barbeque grill, don’t get discourage you can still make delicious paneer kebabs at home. You can sauté paneer and vegetables separate in the pan then mix them, sprinkle lemon juice and chaat masala or arrange them on tooth pick or small skewers then shallow frying them. 2. 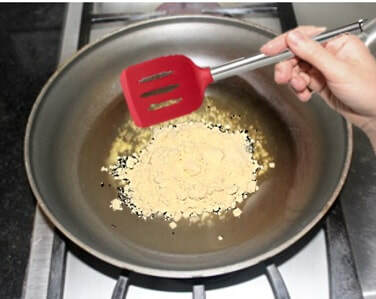 On medium heat add 2 tablespoon of oil in a wide non stick frying pan or use regular tawa and add more oil while shallow frying to prevent it from sticking. 3. Place the tooth pick or small skewers with paneer and vegetables on the pan and fry for 12 to 15 minutes, gently keep turning the skewers around every 2 minutes or so until all the sides are evenly browned. 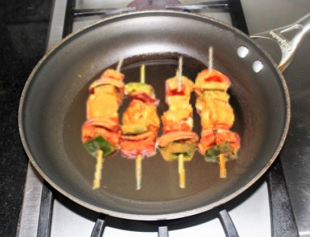 Paneer kebabs are ready to be served. Instead of threading paneer and vegetables on the tooth pick you can sauté them separate in the frying pan, then mix them together and serve. 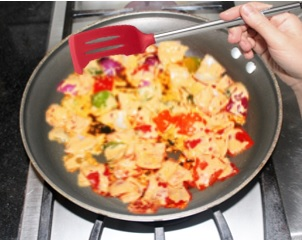 Heat 2 tablespoon of oil in a frying pan, add marinated paneer and sauté for 5 to 6 minutes. Transfer the paneer in a plate then add marinated vegetables and saute 8 to 10 minutes or until they become tender but crisp then add sautéed paneer and mix and serve. 1. Tandoori masala gives paneer tikka smoky flavor which makes tikkas taste much better. Tandoori masala can be purchase from any Indian grocery store. 2. 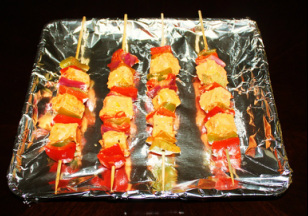 Bell peppers placed first and last on skewer will help kebabs remain stable. 3. For marinate thick hung yogurt is preferred otherwise marinate become watery and it would not coat the paneer and vegetables. If you do not have thick yogurt, take about 3 cups of plain yogurt, line a strainer with a cloth or a kitchen towel, put the strainer inside a mixing bowl. 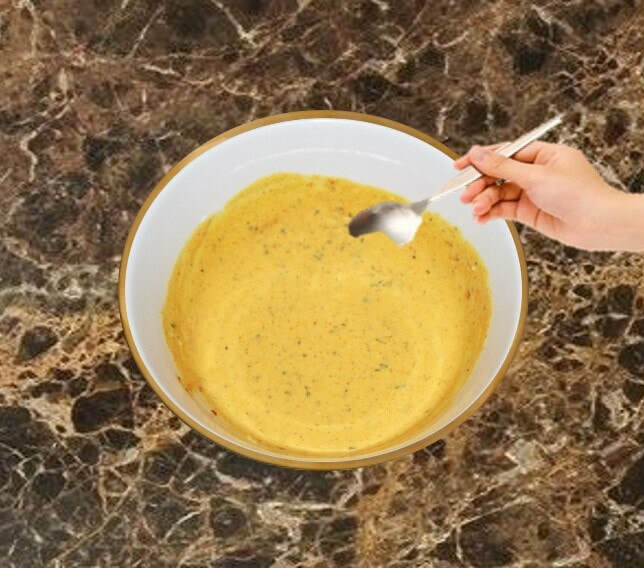 The bottom of the strainer must be suspended at least 1 inch above the bottom of the mixing bowl. Pour the yogurt in the strainer and place it in the refrigerator and leave it for 3 to 4 hours or until all the liquid drips out of the cloth and into the bowl. Scrape out the yogurt from the cloth and it is ready to be used. Strained yogurt should be thick and less than half the original volume. 4. Use vegetables of your choice. Mushrooms, cauliflower, zucchini (Turai), baby corn, squash can be used for grilling.